Recently, Fridays became even more exciting for students at a Salina elementary school. According to USD 305, various groups and organizations are welcoming students at Heusner with high fives as they enter the building from 7:50-8:25 a.m. on Fridays. 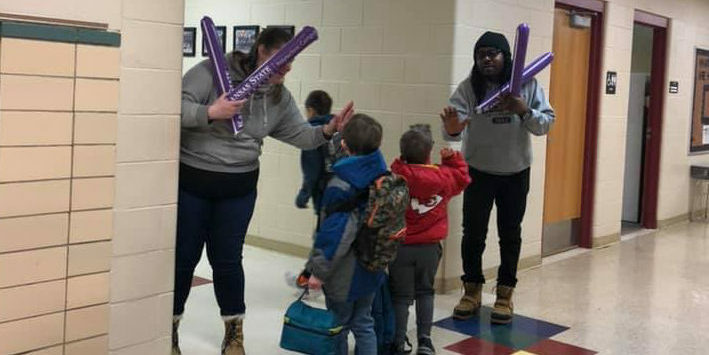 “High Five Fridays are bringing smiles to students’ faces and helping them to see how the larger community cares about them,” explained Lori Munsell, principal at Heusner. Cathy Cash, Heusner’s music teacher, is credited with the original idea. She had a vision and coordinated community members and staff. “High fiving our students acknowledges all of their hard work, their pride and grit as they end another successful week,” said Cash. Kansas State Polytechnic representatives brightened students’ mornings on January 25 and Salina Public Schools board members and district office staff will take the next turn this week. The Salina Police Department will be at Heusner on February 8th to help join in the celebration.